Home / World / Brexit: Theresa May says a second referendum would be a "betrayal"
Brexit: Theresa May says a second referendum would be a "betrayal"
Prime Minister Theresa May says she will not "give in" if she demands a second referendum on Brexit. The People's Vote, a bipartisan Group with some MEPs, calls for a public vote on the final Brexit agreement. Ms. May also says the government is not preparing to reach an agreement, but is confident that it will leave the EU with a "good deal". The UK is well on its way to leaving the EU on 29 March, and the government has previously ruled out another referendum. She writes in the newspaper: "In the summer of 2016, millions spoke.
" In many cases, for the first time in decades, they trusted their votes to count; that after years of feeling ignored by politics, their voices would be heard. "To ask the question again would be a gross betrayal of our democracy – and a betrayal of that trust." Have voters changed their minds? The People & # 39; s Vote campaign was launched earlier this year and has a number of high-profile supporters, including Sir Patrick Stewart and Gary Lineker. It has also received financial support from donors, including Julian Dunkerton, co-founder of fashion label Superdry – who donated the largest donation of £ 1 million to the group. Thousands of supporters took part in a march in central London in June. The campaign looks forward to enough MPs, including the Labor leadership, to support a call for a referendum on Mrs May's agreement with Brussels, to be voted on in Parliament in October. Earlier this week, a leaked memorandum revealed that People's Vote wants Labor MPs and activists to file a motion for this month's party conference, and to oblige Labor to support a new referendum on the final deal. The current political position of the party is to respect the outcome of the Brexit referendum in 2016. 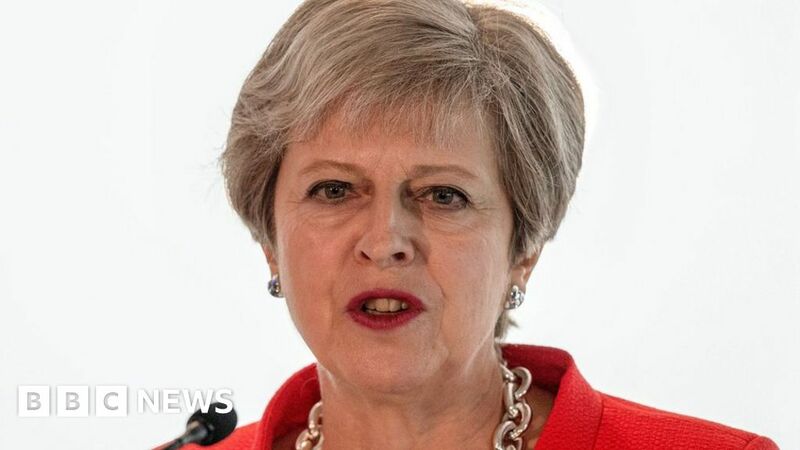 The Prime Minister says the coming months are "critical in shaping the future of our country," but it is "clear "about their mission to fulfill the" democratic decision of the British people ". She said that after the Checkers Agreement in July "real progress" had been made in the Brexit negotiations. While more negotiations are still to come, Ms. May says, "We want to go with a good deal and we are confident that we can achieve one." The government has prepared for a no-deal scenario, although in some sectors this would create "real challenges for the UK and the EU," Ms. May says. But she adds, "We would get through it and live on. " She says she is "not being pushed to accept compromises on the Checkers proposals that are not in our national interest."